Backed by a two-piece rhythm section and singing into a vintage microphone, the reverend spent the first half of the set tearing down his back catalog, playing one song from each album in chronological order (but skipping the Christmas platter). 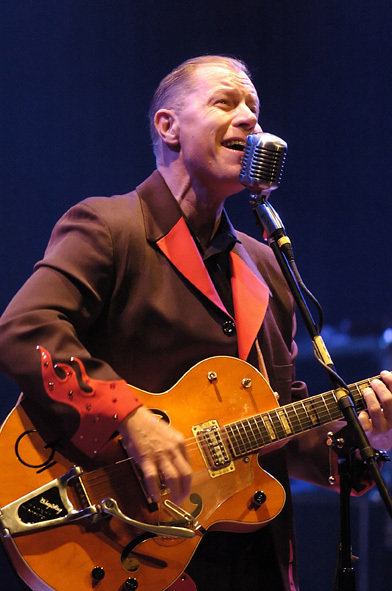 If Brian Setzer dropped the Vegas schtick, he’d sound a lot like Heat. The stripped-down, hot-rod sound that supercharges rock and country is an admittedly narrow shaft to mine, but Heat was able to vary the mood. “Martini Time” found the singer in lounge mode, while “Indigo Friends” was built around warp-speed Chicago blues. The “Jimbo Song” sounded like a lost Ramones track, and hints of surf guitar snuck into a few guitar solos. The performance capped an evening of genre studies at Crossroads. Hometown rockabilly revivalists Rumblejetts opened the night. The six-piece ensemble Dirtfoot brought the night’s most distinctive sounds. The Louisiana-based band wasn’t afraid to put both saxophone and banjo to work on the same song and find out what happens during the ensuing jam. Setlist: Psychobilly Freakout, Lonesome Train Whistle, Baddest of the Bad, Martini Time, Jimbo Song, The Party in Your Head, Galaxy 500, Indigo Friends, Drinkin’ and Smokin’ Cigarettes, Johnny B. Goode, Honky Tonk Night Time Man, Lonely Gun, Rock this Joint, 400 Bucks, Bales of Cocaine, Devil’s Chasing Me. Encore: Big Red Rocket of Love > drum solo > Folsom Prison Blues > Big Red Rocket of Love.